Convenient, Accredited ACLS Training for Busy Healthcare Professionals. Over 1.5 Million Rescuers Trained since 2003. Have a Busy Schedule? ProACLS was Built for You! You shouldn't be restricted from learning however you learn best — whether that's in a classroom, on your couch at home, or on your iPhone in between shifts. 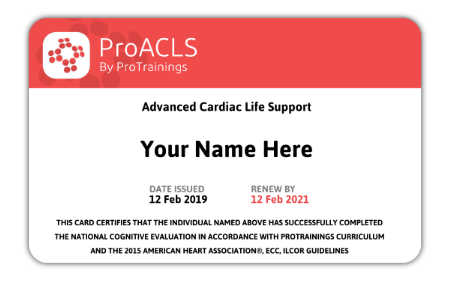 Our ACLS course follows the latest American Heart Association ACLS guidelines with engaging video training from a licensed paramedic who has been teaching students for over 20 years. And you'll earn up to 8 CE credits toward your re-licensure. You will receive 8 credits for initial certification and 4 for recertification. Take the test as many times as you need, with the ability to review video content as you wish. If you need a hands-on component, you can complete your evaluation from the comfort of home via videoconference or take advantage of our nationwide network of skill evaluators. Employer won't accept your card? No problem! We guarantee the acceptance of your certification or your money back. Your certification card is available to you immediately after you pass and pay for your course. A professionally printed card will also arrive in the mail in 5-7 business days. Our training meets and exceeds industry standards -- and is created to give you control. Train when it's convenient for you! Our ProACLS courses are nationally accredited and accepted in your state and nationwide. Acceptance is guaranteed or your money back. Our compliance staff is happy to consult your employer if any issues arise. Forget boring training slides -- our engaging instructor leads you through video training which you can start, stop, and pause without losing progress. You'll always have access to the videos so you can review whenever, wherever you want. 4.6 Rating Based on 1002 Reviews. Online ACLS training isn't simply as good as classroom training. Many people find it to be better training. That's because you can pause and rewind the training if you missed something. And you're experiencing ACLS training with an instructor on his very best day. It's like sitting in the front row of class with an instructor who teaches at exactly your pace. ProACLS is rated 4.6 out of 5 based on 1002 ratings.